Troubling times have come to Holsworthy. Recent strange happenings have happened. Firstly, the strange snowy weather that started off March in whiteness, then secondly, more snow, this is strange, the early closure of CO OP on the 18th of March, but most scarily, Mafia associate Dangerous Dave Millman hasn’t showed up to open his fruit shop. There is no Jag parked outside and no Robin in sight. This is troubling times. There hasn’t been a day where the fruit stall of Holsworthy has been unmanned and with this apocalyptic weather upon us, its a clear sign the end is near for Holsworthy. The Holsworthy Mafia are advising residents to panic and run about mindlessly, this, clearly is the only sensible thing to do and with no milk and bread to feed ourselves on, there isn’t much else for this once peaceful town to do. I walked into town to find Dangerous Dave wasn’t about. I know he’s a member of the Mafia of Holsworthy, but I never knew this day would come where his shop would be closed. The Mafia have good ties with Dangerous Dave Millman. He’s helped us out many times in this town and his presence in the town will be missed for today. But he will most likely return in the morrow. Godfather of Holsworthy – There isn’t much Dave doesn’t know about Holsworthy and what he doesn’t know isn’t worth knowing. His ability to turn up every day of the week is legendary. 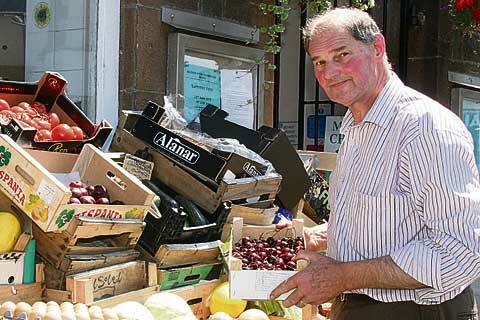 His dedication doesn’t go unnoticed to make sure the people of Holsworthy are served with fresh produce. Despite the Mafia name Dangerous Dave, he is a helpful nice chap. And he drives a JAAAAG and wouldn’t harm a fly. We’ve tracked down Dangerous Dave whereabouts and we can confirm, in all seriousness, he is well, just weather-bound.